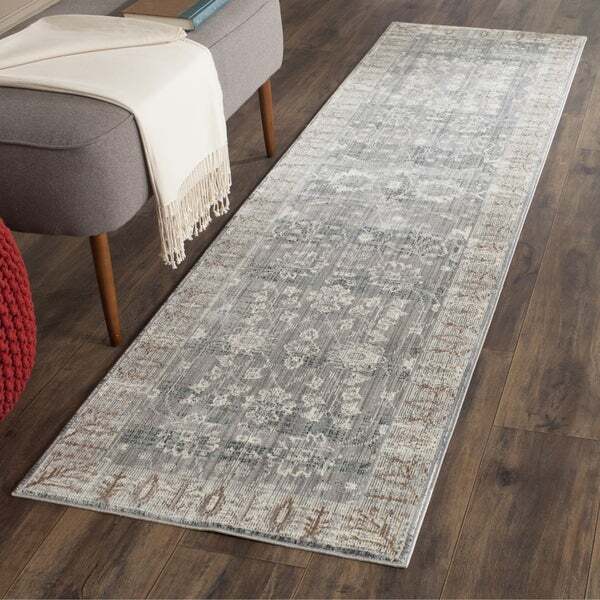 Elegantly designed from Persian influences and colored with over-dyed grey and brown tones, this Safavieh rug adds beautiful accent to your home. 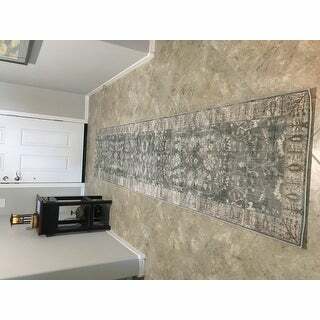 Excellent for hallways and entrances, this rug measures 10 feet long and over two feet wide. Crafted from soft polyester and power-loomed for professional construction, the rug is both comfortable and durable. We purchased a 9x12 rug in the same pattern. This rug while having a similar pattern did not seem to have as many aqua and green threads as the larger rug. I was going to order the 2x8, but found this 2x10 which is a better fit in our entry. I used a quarter inch felt rug pad to give it more softness. This is such a beautiful rug. I put it in my entry way and it pulls colors from every room. I do see more of a grey/brown and even green in some light. It has a very antique feel and is really easy to clean! I have dogs and it cleans up so great! Perfect for an entry way, bedroom or even a kitchen! I love overstock for their amazing rug selection! You won’t be disappointed with this purchase! Other than the rug having a green color that wasn't mentioned in the description, the rug is working for us. Our kitchen center island is 10 feet long, and I often switch up our runner rug. This Savavieh gray rug looks beautiful with our white cabinetry. The quality is great and is very easy to clean. Soft and subtle colors! Perfect for our entry hallway. The color of rug was not as expected - in reality, it looks like thick blue and beige stripes. Also, the bottom of rug is poorly made - it's hard, slippery, and slides all over the place. The runner is beautiful and well made. I wanted a rug that was muted somewhat so not to clash with the one in the next room. I wish it came in a size smaller size as it is longer than I needed but works ok. .
Have this in my kitchen. Definitely needs a rug pad. Colors very muted, which I like because it doesn't clash with anything else in my kitchen. Great for the price. Wasn’t sure about this one but took a chance and glad I did. Super pretty. Subtle colors, nice pile. Purchased the runner. Would recommend. I love this runner but you will definitely need a pad underneath. It will not stay put. It's a bit darker than I thought it would be, but it's very pretty. This rug is perfect. Works well in our new kitchen. Great value. It looks great and i bought a second in complementary design foe adjacent area. I liked the subtle pattern and color. It also had other good reviews.